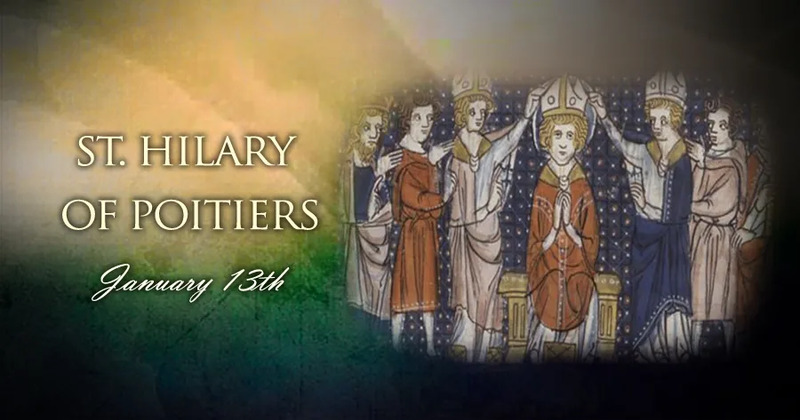 On January 13, Catholics celebrate St. Hilary of Poitiers, a fourth-century philosopher whose studies made him a champion of orthodox Trinitarian theology during one of the most difficult periods of Church history. He protected the Church and its members by brilliantly defending the sacred humanity of Jesus while also defeating aranism which denied Christ's divinity. St. Hilary was a gentle and courteous man, devoted to writing some of the greatest theology on the Trinity, and was like his Master in being labeled a "disturber of the peace." In a very troubled period in the Church, his holiness was lived out in both scholarship and controversy. Little is known about St. Hilary's life before he became a bishop. Fittingly, what historians do know about him derives mostly from personal details contained within his extensive theological works. Those remarks indicate that Hilary was born to a pagan family in present-day France, most likely around 310 – three years before the Roman Empire declared its official toleration of Christianity. Hilary himself grew up apparently without any significant Christian influence, but received an otherwise comprehensive education in the Latin and Greek classics. Not unusual for his era, he rigorously studied both Greek philosophy and the Bible. Like many other early Church Fathers, he came to accept the truth of the Bible by recognizing its compatibility with philosophy and the sciences. This was a gradual process for him, however, and it was not until 345 – by which time he was already married, and had a daughter– that Hilary committed himself to full membership in the Catholic Church by receiving baptism with the rest of his family. His rise within the Church, however, was not gradual at all: around 353, the people of Poitiers called for him to be made their bishop. By its nature, the position involved tremendous responsibility, as well as significant personal sacrifice. While the early church permitted some married men to become bishops, they were traditionally required to practice celibacy within marriage, and many adopted a radically simplified lifestyle akin to monasticism. There are indications that Hilary followed this ascetical path, once ordained. Moreover, Hilary's election as the Bishop of Poitiers coincided with the second wave of the Church's first great doctrinal controversy, in which he would play a significant role. Although the Council of Nicaea in 325 had confirmed the Church’s rejection of Arianism – which claimed Jesus was only human, not divine – powerful forces within both the Church and the empire clung to the heresy. Only a few years after his assumption of episcopal rank, Hilary found himself virtually alone in defending Jesus’ deity before a hostile crowd of bishops in the southern French region of Gaul. The bishops appealed to Emperor Constantius II, who favored a modified version of Arianism and declared Hilary’s exile from Gaul. Constantius II did not likely suspect that by banishing Hilary to Phrygia he would inspire the bishop to mount an even greater defense of orthodox theology. There, he wrote his most important work, “On the Trinity,” showing the Bible’s consistent witness to the central mystery of Christian faith. Remarkably, this staunchly orthodox bishop also showed great charity toward those he believed were honestly mistaken. He worked closely with groups of clergy and faithful whose formulations of dogma he perceived to be merely imperfect or imprecise, but not intentionally heretical, to support what was correct in their understanding and lead them into full adherence with tradition. Hilary even traveled to Constantinople during his exile, to explain to the city’s bishops why their emperor was not orthodox. After the death of Constantius II in 361, Hilary was able to return to his diocese at Poitiers. Once exiled for opposing Arianism in Gaul, he lived to see it squarely condemned in the local church after his return. Although deeply committed to the leadership of his own diocese, Hilary took steps late in his life to support orthodox teaching in other regions. Most significantly, he denounced Auxentius, the Arian bishop of Milan. Subsequent opposition to Auxentius led to his succession by St. Ambrose of Milan, who, in turn, greatly influenced the conversion of St. Augustine. St. Hilary died at Poitiers in 367, after having passed on his teachings and way of life to a number of students, including St. Martin of Tours. Long regarded and celebrated as a saint within the Church, St. Hilary was also declared a Doctor of the Church in 1851.